The good people at Narragansett sent me over two sample cans of their summer brew. This is the first time in its 120 years of production that Narragansett has ever produced a seasonal summer craft brew. I could not be happier. One of the best things about summer besides the weather is from most people, the barbecue. In New England that means cooking up a few lobsters, roasting some fresh roast corn and red potatoes, and a ice cold beer. It is one of the most relaxing things to do on the few days off I have. The beer not a heavy hitter with only 4.2% alcohol by volume. The perfect partner to a hot day of lawn mowing. This session Blonde Ale imitates a normal pale ale with spiced citrus and passion fruit notes. The clear golden colored brew has a full think fluffy white head that lasts on for a bit. Then grainy light malt flavor is hidden on the edge of the sharp bitterness that peaks and cools. This is a much bolder brew than most companies go with when branding a summer brew, but its a very welcome addition to my refrigerator this season. Look for it in the classic tallboy cans and draught at select local bars. 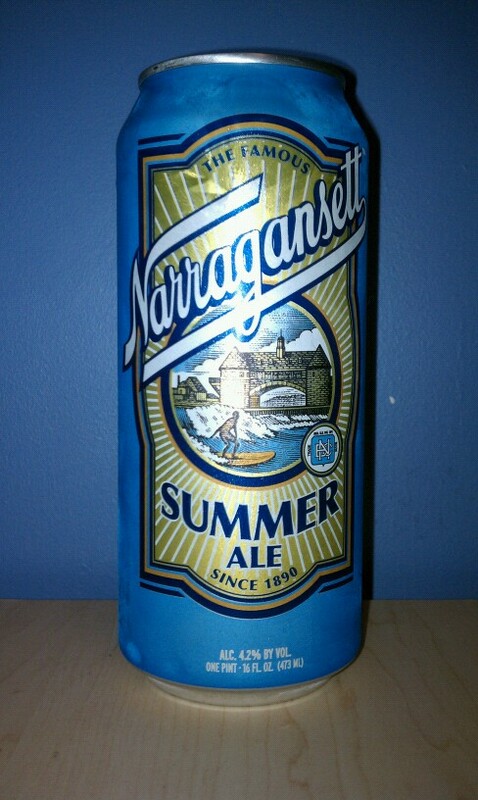 Check out http://www.narragansettbeer.com/products/summer-ale for more info on this brew and where to find a location to purchase this and other Narragansett brews.